ZonePopper™ is an app for Android Phones. ZonePopper for Android gives you immediate on/off control of your EtherRain for zone and valve testing. In addition, ZonePopper can run complete cycles quickly and immediately with only a few taps - perfect for when visual inspection determines that your landscape needs a little extra irrigation. Note: There is also a version of ZonePopper for iOS, but this version is for Android devices. ZonePopper implements the EtherRain discovery service and will automatically discover all EtherRain controllers on your network. 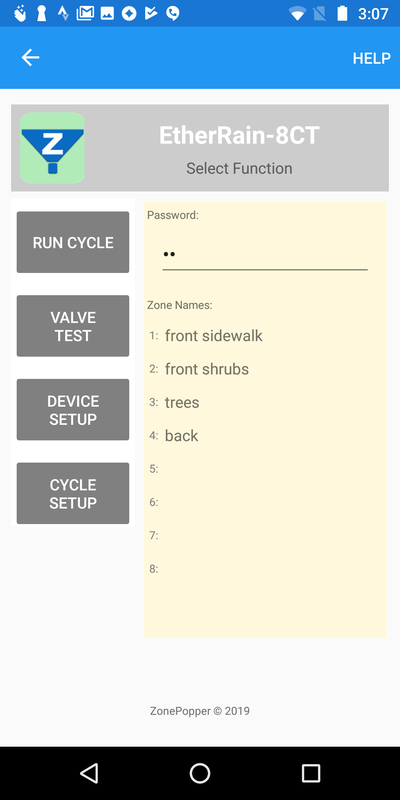 ZonePopper provides valve testing cycles or complete manual cycles with only a few taps on your Android phone screen. To use ZonePopper, your Android device must be within Wifi range of the Wifi network that is connected to the LAN that hosts your EtherRain controllers. ZonePopper will find all of the EtherRain controllers on your network (your device must be connected to the WiFi network associated with the LAN that hosts your controllers). Tap the name of the controller that you want to use. 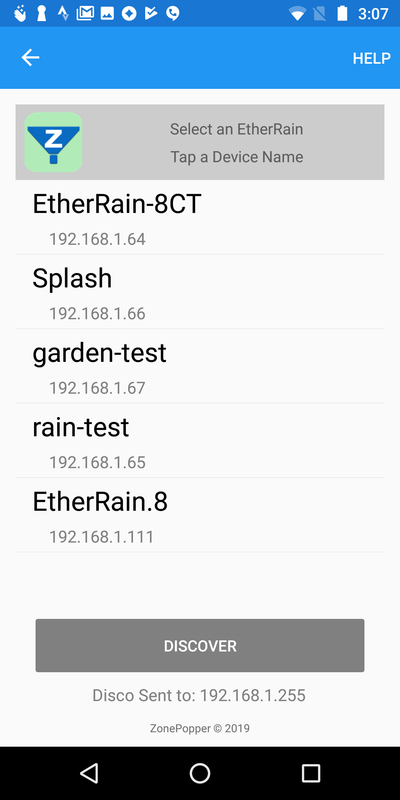 If you have multiple EtherRain controllers on the same network each EtherRain should be given a unique name. 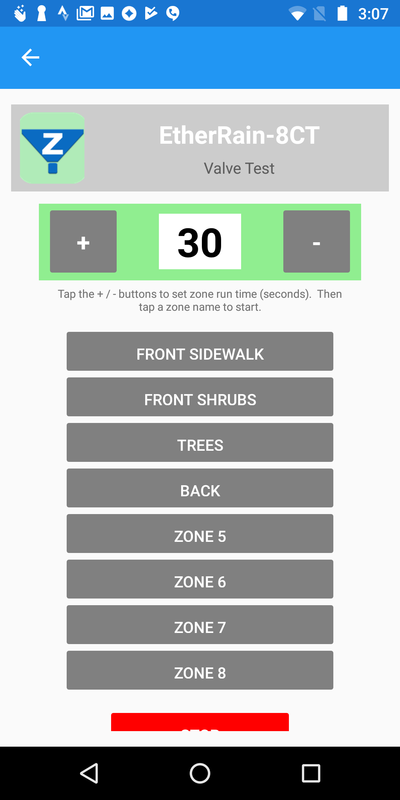 Once you have decided the names of your controllers you can set up the controller within ZonePopper by naming the zones and setting the password. Use EtherRain Admin for naming and network configuration. If your EtherRain controllers are not displayed on the main screen, make sure you are in range of your WiFi network. The functions page is displayed after the controller has been selected. Both "Run Cycle" and "Valve Test" are accessible from this page. A valid password must be entered in the password field in order to proceed to the "Run Cycle" or "Valve Test" pages. The password for the controller can be saved by tapping the "Device Setup" button. Once the controller password has been saved it will be automatically entered when the Function page is displayed. The "Device Setup" function lets you enter names for the controller's zones, in addition to saving the controller password. The "Cycle Setup" function lets you define and save a cycle for use when running a cycle. Up to four cycles can be saved per controller. Tap "Run Cycle" on the functions page. On the Run Cycle page, enter the run times for each zone in minutes. The maximum run time permitted per zone in ZonePopper is 60 minutes. After entering all of the zone times, tap "Run Cycle" and if the controller is ready to accept a command, the cycle will run. The cycle will execute sequentially as is typical for all EtherRain cycles. Once the cycle is running you can exit the app - EtherRain will manage the cycle with no further input from the app. If you need to stop the cycle tap the "Stop Cycle" button. Tap "Valve Test" on the functions page. On the Valve Test page, set the valve test run time by tapping the + or - buttons. The run time is in seconds and will be displayed on the screen. The maximum valve test time is 120 seconds. Tap the button the represents the zone to be tested. If the controller is ready, and your device is within range of your Wifi signal, the zone will open for the prescribed number of seconds. The valve test can be stopped at any time by tapping the red "Stop" button at the bottom of the page. The controller password and zone names can be entered and saved in the Device Setup page. Entering and saving this information allows you to run cycles and test with minimal effort. Up to four cycles can be defined for each controller. These cycles can be defined by tapping "Cycle Setup" on the function page. Saved cycles will appear by name on the Run Cycle page. 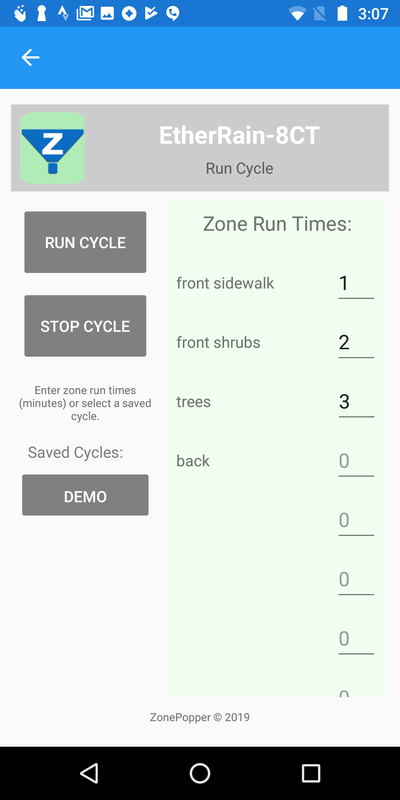 A complete saved cycle can be loaded into the run cycle page with just one tap. To view the EtherRain frequently asked questions (FAQ) page, click here. For information on schedulers and scheduling software compatible with EtherRain, click here.